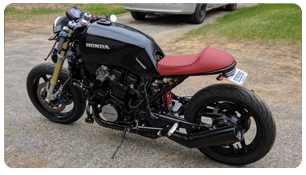 Sorry to hear about quitting street bikes but I also understand, have had way more close calls in the last two years than in the previous 20+ years... Tbat said, the more bikes out there the better for getting noticed. Thanks Jon for your comment. You're right about more bikes the better, louder too doesn't hurt (even though a lot of people are against it -- car drivers probably ), at least the bike will be going to someone else who will ride it. This user High Fived sugarkryptonite! Think how much simpler your life will be with an xr200! I'm lucky to be riding in a pretty low traffic area. Don't see many bikes around here at all, but it seems that makes drivers notice bikes easier. 95% of all cars that pull up behind me in traffic stop waaaay back like they are afraid to get close. Cool deal with a dirt bike, though. That's definitely a whole other world of fun with much less of a risk level. Don't be a stranger. We have a dirty bike section, too!